If anyone wants to know how to make cheap, easy fuel tanks or a depot, here's my take on it. 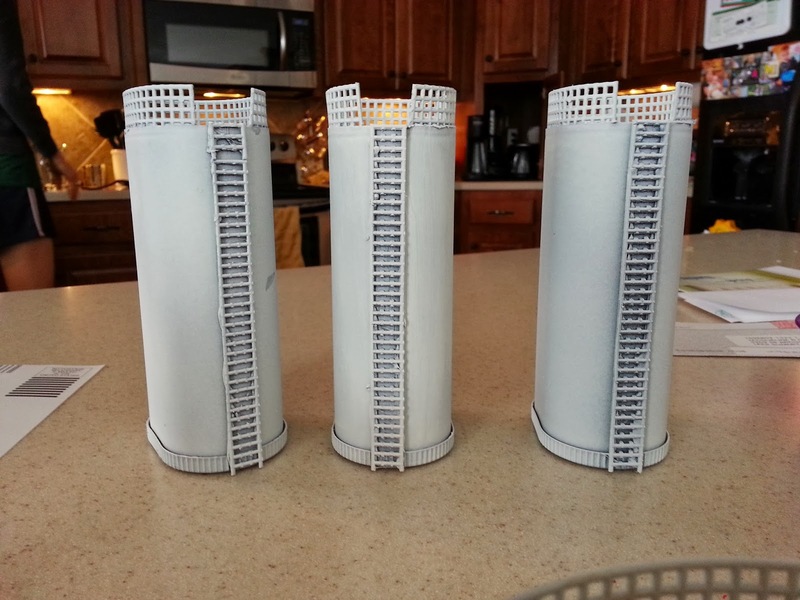 I started with three Crystal Light containers and a CD spindle. Research showed these types of containers are typically white. Very white, if well maintained. 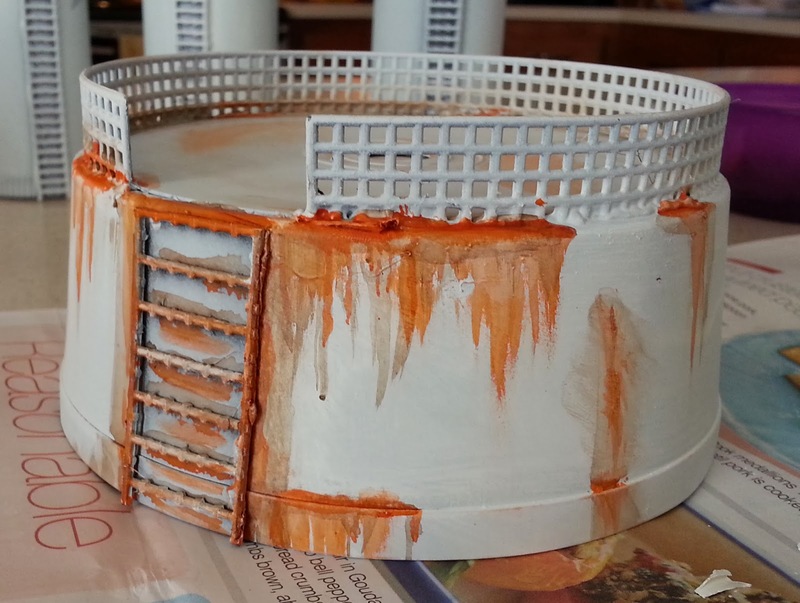 I decided early on that mine would be weathered and rusty. For railings and ladders, I went with my trusty Granny grating (cross-stitch mesh). 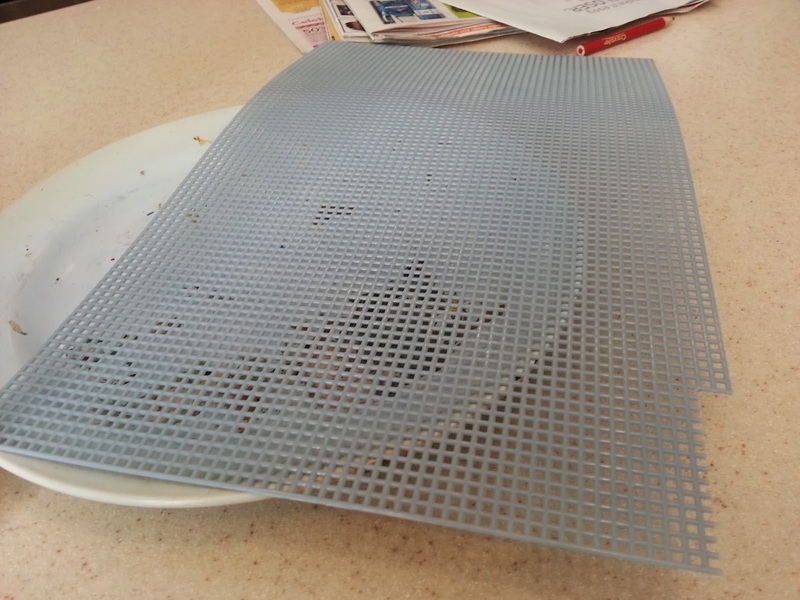 It's easily used in this capacity, as well as for grated floors. 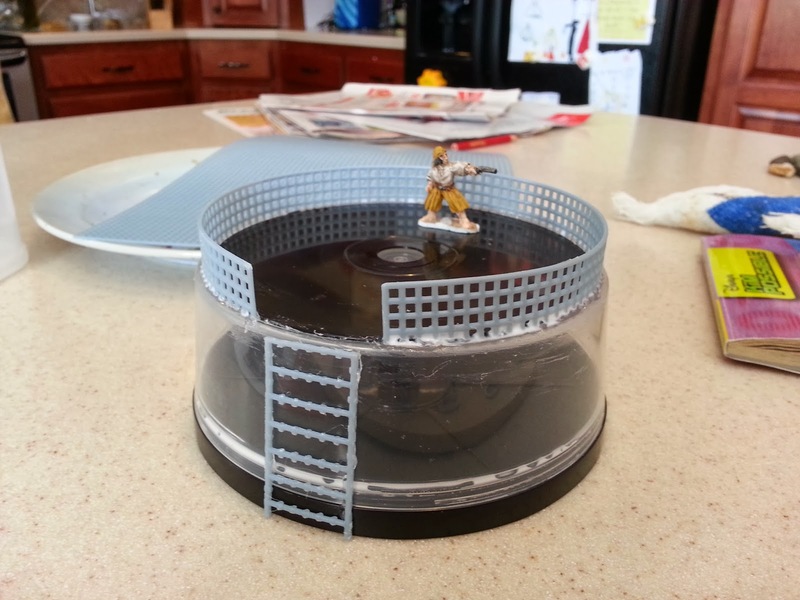 I cut out railings and ladders to fit and then hot/PVC glued them to the structures. 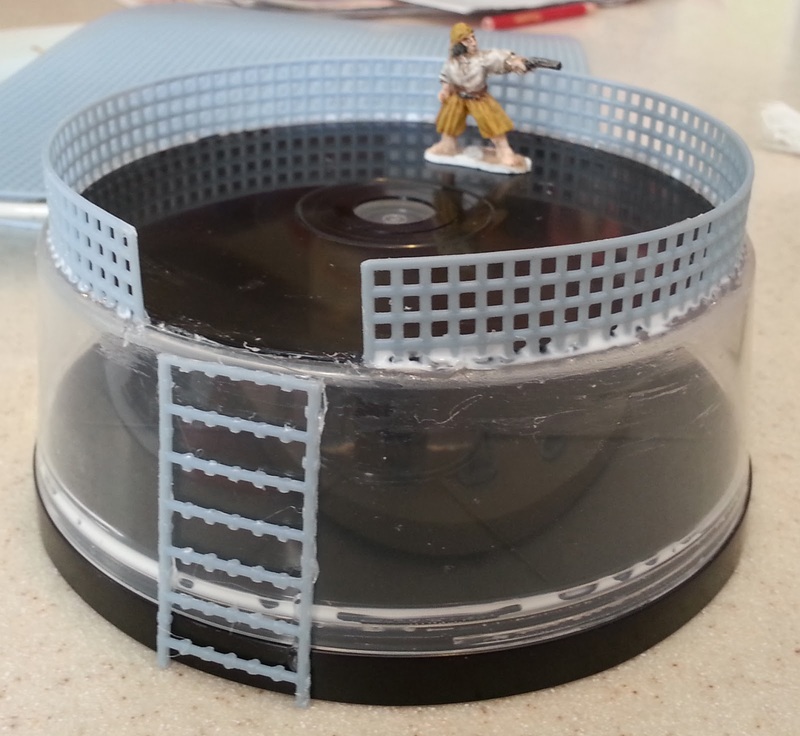 Here is the CD spindle with grating for an extra wide ladder and a railing. That's an Old Glory pirate for scale purposes. I used hot glue to pin the railing into place and then reinforced it with Aleene's Tacky Glue (absolutely my favorite white glue). 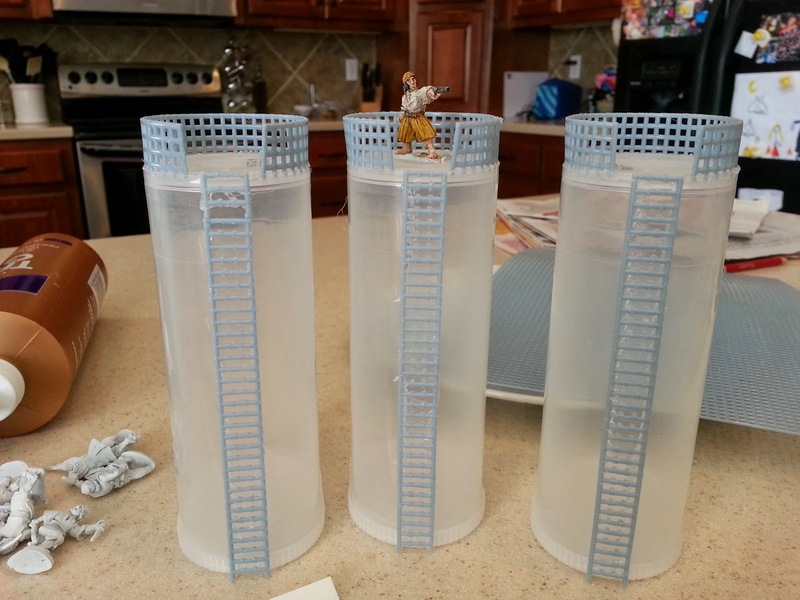 Here are the silos, again with ladders, railings and a pirate. After that dries, I primed the whole collection with flat black spray paint. 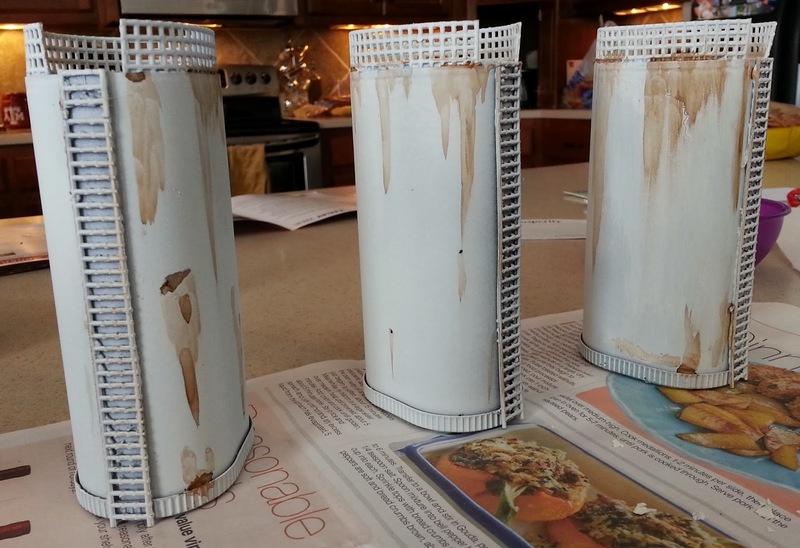 When that dried, I over coated it with flat white spray paint to form a mottled gray. I was sorely tempted to leave them that color, as they wouldn't stand out too much on a battlefield, yet they would look presentable. I decided to try to whiten them further. 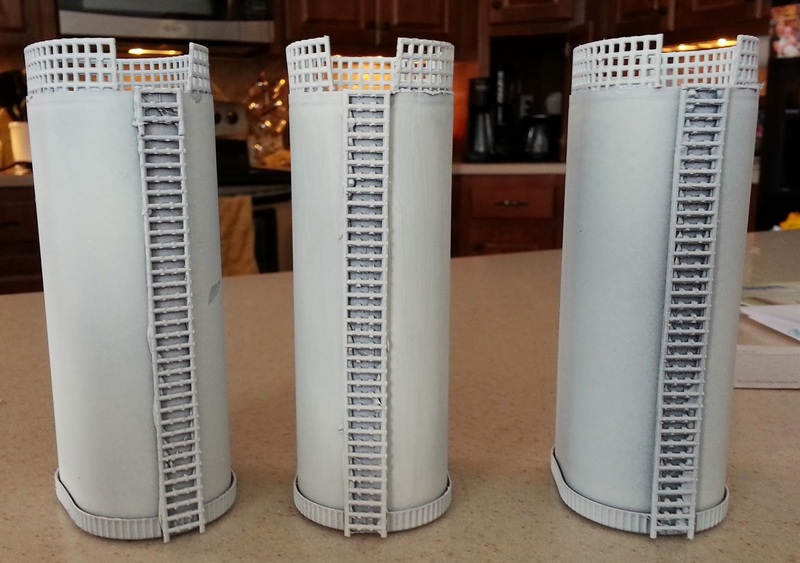 Here are the silos after a couple more coats of flat white spray paint. How to weather them? In my mind, I see rust as orange and brown. I used orange ink first, which was a mistake. Too bright! I dampened that hue down quite a bit with brown ink, but it was still too bright. One trick I learned was to apply a semi-heavy layer in an area and then 'pull down' with my finger to create the impression of a liquid flowing and then drying out, leaving a stain on the white surface. Thank you Bob Ross. 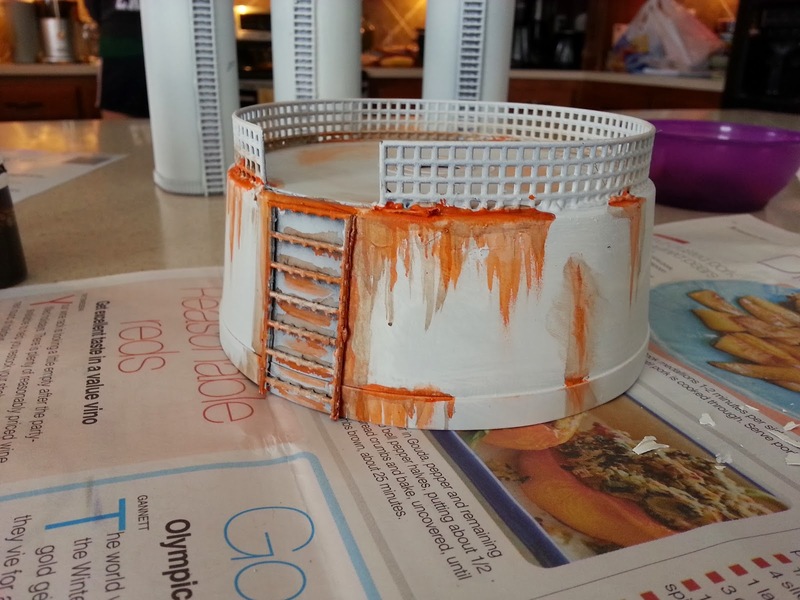 I then hit the heaviest orange areas with brown paint. This did help, but it's still pretty orange. I consider this fuel tank to be corroding and not given maintenance. 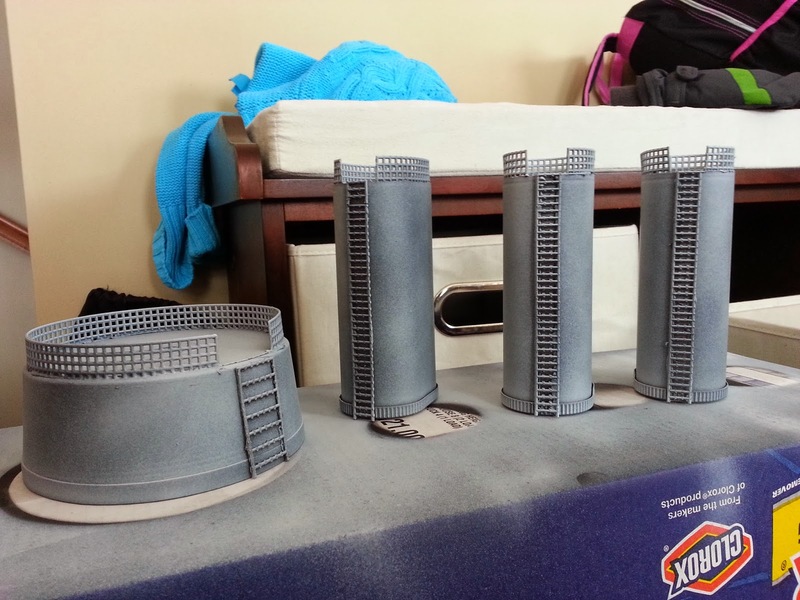 Having learned my lesson with the fuel tank, the silos received a different treatment. I forewent the orange altogether and stuck with brown ink. 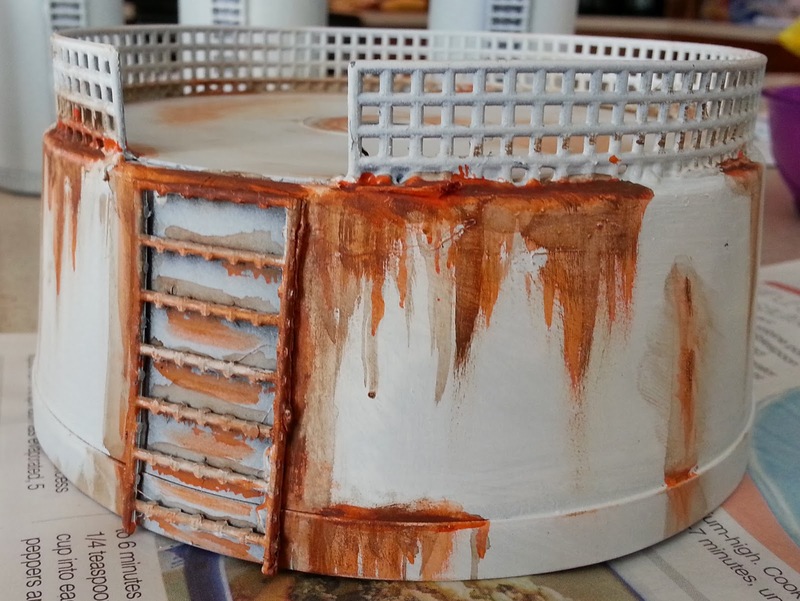 To me, they look like they are dirty, but not quite to the really rusting stage. A quick gloss coat of sealant later and there you have them. 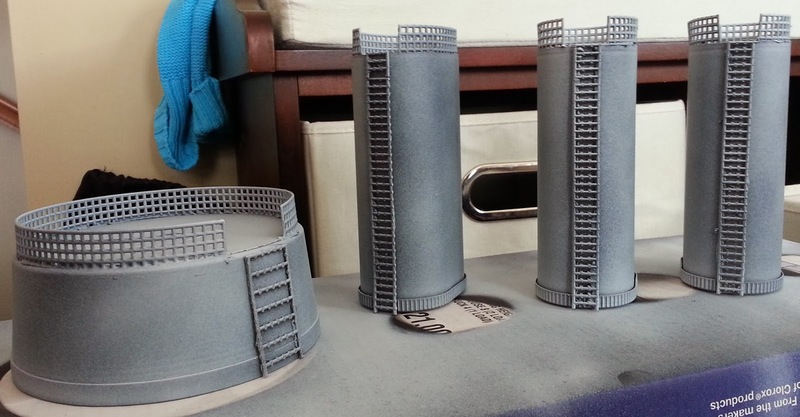 A quick, easy and cheap set of fuel tank terrain. Looking good, if not a little rusty. Thanks, Parduz. Those binders are perfect! If it were a taller CD spindle, I'd have made a spiral staircase instead of a ladder.